A shareholder agreement establishes the terms, duties, obligation, rights, privileges between the shareholders of an Illinois corporation. Its purpose, among many, is to protect the shareholders’ investments in the corporation and sets out the shareholders’ rights and responsibilities; regulates the sale of corporate shares; describes how the corporation will be run; provides an element of protection for minority shareholders; and delineates the decision-making process and how important decisions will be made. A well-drafted, thoughtful shareholder agreement ensures that the corporation runs efficiently, effectively and ensure that shareholders’ responsibilities are accounted for. The provisions of the shareholder agreement establishes clarity and certainty as to decision-making, duties, and rights; reduce the chances of conflict between shareholders (which is very important); and establishes the platform necessary for the corporation to run smoothly. A shareholder agreement works in conjunction with the company’s articles of incorporation and corporate bylaws but should provide the shareholders more protection than the articles of incorporation because it is comprehensive, highly negotiated and includes more operational details and protective provisions defining or limiting shareholder responsibilities. A shareholder agreement is important in that it sets out the decision-making authority and restricts or broadens the power of the directors where necessary, and protects certain officers and directors when making decisions on behalf of the corporation against possible derivative actions of other shareholders, whether they are minority, majority or equal shareholders. Further, a well-drafted, thoughtful shareholder agreement not only prevents shareholder disputes but also provides a framework and procedure for dispute resolution. Establishing a shareholder agreement often facilitates the process of raising finance from banks and demonstrates to potential shareholders, corporate executives and/or investors that the business is stable and well organized. The shareholder agreement, along with the bylaws, ensures stability because it prevents disruption and changes in the company’s situation when one shareholder’s personal circumstances change. For instance, shareholder agreements safeguard each shareholder’s financial interest in the company, and the interests of the shareholders’ families in the event of death. 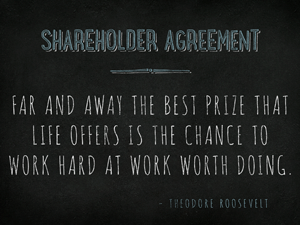 Finally, shareholder agreements protect the rights of minority shareholders and the investment value of the holding. Without this type of agreement in place majority shareholders may act against the minority shareholders’ interests.